LONDON--(BUSINESS WIRE)--The global corporate e-Learning market is expected to register a CAGR of close to 11% during the period 2018-2022, according to the latest market research report by Technavio. However, the growth momentum of the market is expected to decelerate due to a decrease in the year-over-year growth. A key factor driving the market’s growth is the increase in employee satisfaction. Training is essential for employees’ productivity. People who start their jobs without proper training are prone to stress and anxiety. Hence, proper training needs to be provided to new hires. The initial training plays an important part in an employee’s job. Also, regular learning sessions are important as knowledge tends to recede over time. Providing training to employees increases an employee’s satisfaction at work, increases their know-how, keeps them updated on the latest developments in their respective field. This market research report on the global corporate e-Learning market 2018-2022 provides an analysis of the most important trends expected to impact the market outlook during the forecast period. Technavio predicts an emerging trend as a major factor that has the potential to significantly impact the market and contribute to its growth or decline. Microlearning involves smaller learning units compared with the traditional method of learning. In a fast-paced world with short attention spans of individuals, it becomes difficult to keep participants interested in training modules for longer durations. As a result, corporate e-learning players are moving from long-duration training courses to microlearning. Several corporate e-learning players provide microlearning solutions. Being mobile-friendly, microlearning modules can be accessed by learners as per their convenience. “The idea of microlearning is to help participants learn better and faster through short learning modules. Additionally, the information provided by microlearning is concise and relevant and helps address the knowledge gaps of participants,” says a senior analyst at Technavio for research on education technology. 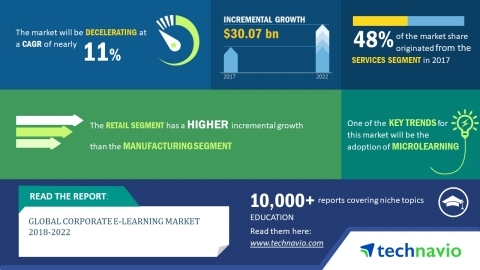 This market research report segments the global corporate e-Learning market into the following end-users (services, manufacturing, and retail) and key regions (the Americas, APAC, and EMEA). The services segment held the largest market share in 2017, accounting for nearly 48% of the market. This end-user segment is expected to dominate the global market throughout the forecast period. The Americas held the highest share of the global corporate e-Learning market in 2017, accounting for a market share of approximately 38%. The market share occupied by this region is anticipated to decrease by nearly 4% during 2018-2022. The global corporate e-Learning market is expected to register a CAGR of close to 11% during the period 2018-2022, according to Technavio.